MASON, Mich. (Jan. 20, 2017) – Before exploring the ocean depths, one must learn the ins and outs of scuba diving. That is just what a group of injured veterans did during a recent Wounded Warrior Project® (WWP) workshop. The hands-on instructional gathering allowed warriors to see what is possible when they connect with fellow warriors and their local community. 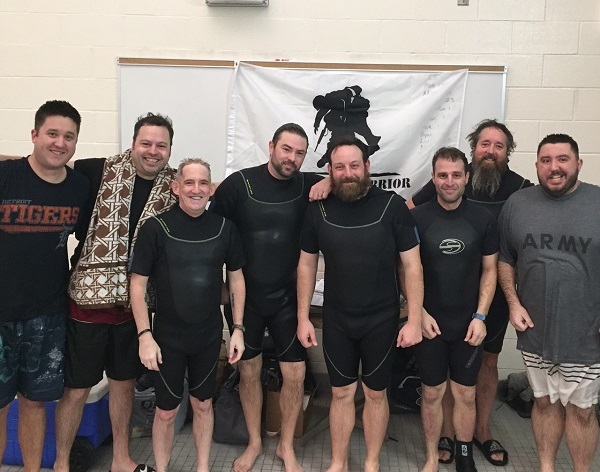 Participants worked with the Michigan chapter of the Dive Pirates Foundation, a nonprofit organization that trains and equips individuals for adaptive scuba diving. Following the workshop, the Dive Pirates offered participants the opportunity to continue working toward their official scuba certification at no charge. After a short introduction to scuba safety and gear functions, the group suited up and paired with instructors for interactive guidance in the pool. These connection activities support the long-term recovery needs of warriors by reintroducing them and their families to the unique bonds experienced during military service. In a WWP survey of the injured warriors it serves, more than half of survey respondents (51.7 percent) talked with fellow Operation Enduring Freedom, Operation Iraqi Freedom, or Operation New Dawn veterans to address their mental health issues, and 29.6 percent expressed physical activity helps. WWP staff interacted with warriors throughout the day, advising them of additional services and personalized therapeutic outlets to assist in their recovery processes. WWP offers a variety of programs and services that help injured veterans with mental health, physical health and wellness, career and benefits counseling, and connecting with other warriors and their communities. Generous donors make it possible for wounded warriors to take part in outreach activities and benefit from program resources at no cost to them. To learn and see more about how WWP’s programs and services connect, serve, and empower wounded warriors, click on multimedia, then images.